Dogs can read our intent. They not only pick up on the words we say but also when we want to communicate with them. This is according to József Topál of the Hungarian Academy of Sciences, in Budapest, Hungary and his team. The findings might help to explain why so many people treat dogs like their children. Dogs seem to understand us when we talk to them. And as the study suggests, a dog's receptivity to human communication is similar to that of a young child, researchers say. They published their report online in the Cell Press journal Current Biology. "Increasing evidence supports the notion that humans and dogs share some social skills, with dogs' social-cognitive functioning resembling that of a 6-month to 2-year-old child in many respects," said Topál. "The utilization of ostensive cues is one of these features: dogs, as well as human infants, are sensitive to cues that signal communicative intent." It is said that a dog can understand an average of 140 words which is the same as that of a 2 year old child. Those cues include verbal addressing and eye contact, he explained. Whether or not dogs rely on similar pathways in the brain for processing those cues isn't yet clear. Recent evidence suggests that preverbal infants’ gaze following can be triggered only if an actor’s head turn is preceded by the expression of communicative intent. Such connectedness between ostensive and referential signals may be uniquely human, enabling infants to effectively respond to referential communication directed to them. In the light of increasing evidence of dogs’ social communicative skills, an intriguing question is whether dogs’ responsiveness to human directional gestures  is associated with the situational context in an infant-like manner. Borrowing a method used in infant studies, dogs watched video presentations of a human actor turning toward one of two objects, and their eye-gaze patterns were recorded with an eye tracker. Results show a higher tendency of gaze following in dogs when the human’s head turning was preceded by the expression of communicative intent (direct gaze, addressing). Topál's team presented dogs with video recordings of a person turning toward one of two identical plastic pots while an eye tracker captured information on the dogs' reactions. In one condition, the person first looked straight at the dog, addressing it in a high-pitched voice with "Hi dog!" In the second condition, the person gave only a low-pitched "Hi dog" while avoiding eye contact. Each trial presented video recordings that started with an introductory phase during which the model that had two pots on each side was facing down in a still position for 2 s (A). The second phase was an addressing phase that lasted for 3 s and differed according to the experimental conditions. In the O (ostensive; A, B, D) condition, the model raised her head, looked straight at the dog, and addressed the subject (‘‘Hi dog!’’) in a high-pitched voice (B). In the NO (nonostensive; A, C, D) condition, with her head facing down, the model addressed the dog using low-pitched voice (‘‘Hi dog!’’) while a salient moving image was overlaid on the head (C). This attention-getter was present for 2 s and served to create attentional demand similar to that in the ostensive condition. The verbal signal in the two conditions had similar duration and intensity but differed in pitch. 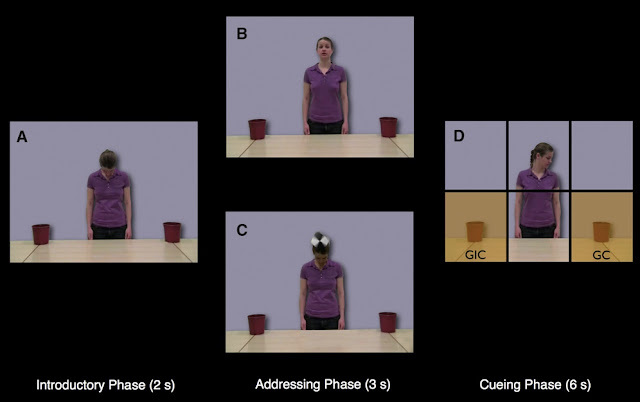 In the cueing phase (6 s), the model turned her head toward one of the two containers (1 s) and remained motionless (5 s) while showing neutral facial expression (D). GC indicates the gaze congruent and GIC the gaze-incongruent regions of interest (ROI). The data show that the dogs were more likely to follow along and look at the pot when the person first expressed an intention to communicate. "Our findings reveal that dogs are receptive to human communication in a manner that was previously attributed only to human infants," Topál said. As is often the case in research, the results will undoubtedly confirm what many dog owners and trainers already know, the researchers say. 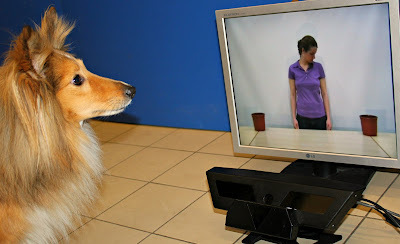 Notably, however, it is the first study to use eye-tracking techniques to study dogs' social skills. "By following the eye movements of dogs, we are able to get a firsthand look at how their minds are actually working," Topál said. "We think that the use of this new eye-tracking technology has many potential surprises in store."